Petroglyphs and pictographs are terms used by archaeologists to describe forms of rock carvings and paintings. Petroglyph refers to a rock carving or etching, while pictograph is commonly applied to a rock painting. Typically, these "rock art" examples are found in caves or under overhanging cliffs. Although both types of rock art can be traced back to early prehistoric times, many traditional aboriginal (native) cultures in Africa and Australia still practice the art of rock painting. Some of the oldest known rock art features are pictographs. In France and Spain, cave paintings made by early humans have been dated to more than 30,000 years old. Located in deep, underground passages, they have been protected from rain, sunlight, and other ravages of time. Most of these colorful images are of animals such as deer, bison, and antelope. They are strikingly detailed and lifelike. and people spread out across the Western Hemisphere, so did the use of rock art. Eventually, nearly all of the more than 200 distinct Native American tribes in North America used some form of rock art in their ceremonies. Interestingly, many of the artistic elements or patterns used in petroglyphs and pictographs are very similar among these diverse groups. From present-day cultures that continue to create rock art, archaeologists have learned that petroglyphs were made by using a handheld stone as a chisel or hammer to etch designs into boulders. Pictographs, however, were more complex to make because of the materials required for paint. Red pigments, which generally make up the most common color found in rock paintings, were made from iron oxides. Other minerals used to create colors were talc, gypsum, or lime for white; charcoal or graphite for black; and copper ores for greens and blues. These minerals were ground into fine powders, then mixed with a resin, such as pine pitch. An oil base was sometimes added by grinding certain seeds or melting animal fat. Paints were applied either by fingers or with brushes made from animal fur, fibrous plant leaves, or the shredded end of a stick. 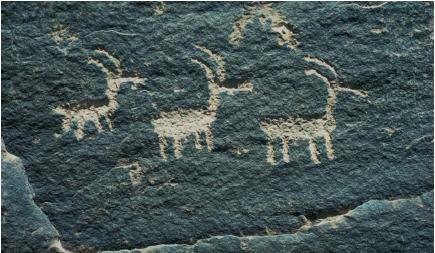 Many of the pictographs and petroglyphs created by ancient people have lasted for hundreds—even thousands—of years. However, modern pollutants and vandalism have recently hastened their destruction. Governments have passed laws protecting areas that contain such rock art. And scientists continue to study the chemical composition of these features, hoping one day to find an effective way to prevent further erosion and preserve these artistic works indefinitely. Is an engraving on a cave wall a petroglyph? Some images have an incised outline which is then infilled with colour - is this a petroglyph? The reason I ask the question is that there are many engraved images in the caves and rock shelters in the Vezere Valley, but they do not seem to be referred to as petroglyphs.